Mechanical insulation contractors usually are subcontractors to a mechanical contractor. They also work with the plumbing, heating, and air conditioning contractors. On industrial work, they may be subcontractors or they may work directly for the plant. For a typical job, such as a new hospital, the community hospital board would decide the needs and arrange financing. The hospital board would then select an architect and engineers to design the building, draw plans, and write specifications. The plans would show every detail of the building including plumbing, heating, and air conditioning systems. The specifications would state what materials are acceptable and what methods are to be used in construction, including insulation. The insulation specifications spell out not only what materials are acceptable, but also how they are to be installed and finished. Architects and owners would then take bids from general contractors for the complete construction of the building. There usually is a project time limit with a penalty if the job is not completed within the given time. The general contractor then takes bids from subcontractors for such work as plumbing, heating, and air conditioning. The insulation contractors bid with the plumbing, heating, and air conditioning contractors, and are subcontractors to them. On some jobs there may be a construction manager instead of a general contractor. The construction manager would take bids from all the major subcontractors. In building construction, general contractors normally do the major components of the building structure. The general contractor usually does such work as carpentry, cement, and clean-up work. Other work is done by contractors who use their own tradesmen to do only the specific tasks in their field. Examples are: plumbing contractors, electrical contractors, or mechanical insulation contractors. These contractors are known as specialty contractors. Some general contractor employees perform work in more than one craft. But the specialist such as mechanical insulation contractors have great pride in their work and are the best in their field. A mechanical insulation journeyman or mechanic must complete a training period in insulation work, or learn the trade through years of on-the-job experience. To be a first class mechanic, most trainees serve a four-year training period. Some exceptional individuals advance faster and may be craftsmen in less than four years. The trainee who develops good work habits and skills is consistently employed, and becomes an insulation mechanic. Individuals applying thermal insulation were formerly known as asbestos workers. 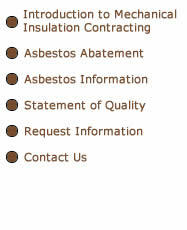 Today, asbestos is not used in conventional insulation work. More appropriately, names are now insulation worker, or pipe coverer. A mechanical insulation contractors' estimate for a job bid is based on four considerations. (4) A mark-up for overhead and profit. When an insulation contractor is a low bidder and receives a contract for his portion of the work, he then submits plans for materials and methods for the architect's approval. When the submittal is approved, he proceeds with obtaining material and performing the work as the job requires. The plumbing and heating contractors as well as the general contractor will have a superintendent or foreman on the job. The insulation contractor and his crew work in cooperation with these people while on the job. In industrial work, the insulation contractor may subcontract or contract direct with the plant. Except for new construction or installation, most industrial work is direct with the plants, usually through the plant engineer. Ships require a tremendous amount of insulation on boilers, pipe systems, and hulls. Contractors at shipyards do this insulation installation. Systems and applications on ships would be similar to those in buildings. A crew of workmen performs the work with a foreman who may or may not work at applying material. Mechanics, apprentices, and laborers, as needed by the scope of work are part of the crew. As soon as a trainee begins in this trade, he should obtain all the hand-tools necessary to do the job. Without proper tools a trainee cannot correctly apply insulation and learn the trade. The following is a partial list of the tools needed. Hard hats are considered personal equipment, and usually are furnished by the workers. Safety equipment such as safety belts, goggles, and shields are usually furnished by the employer. Industrial jobs also vary from small one-day maintenance jobs to large power plant jobs that take more than one year to complete. The contract amount for insulation on a nuclear power plant may be millions of dollars. Paper mills, refineries, chemical plants, and synthetic fiber plants all require a tremendous amount of insulation work.